Middle High German (abbreviated MHG, German: Mittelhochdeutsch, abbr. Mhd.) is the term for the form of German spoken in the High Middle Ages. It is conventionally dated between 1050 and 1350, developing from Old High German and into Early New High German. High German is defined as those varieties of German which were affected by the Second Sound Shift; the Middle Low German and Middle Dutch languages spoken to the North and North West, which did not participate in this sound change, are not part of MHG. 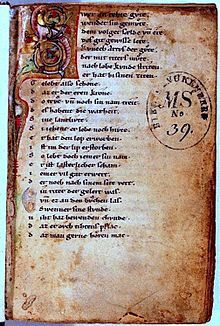 While there is no standard MHG, the prestige of the Hohenstaufen court gave rise in the late 12th century to a supra-regional literary language (mittelhochdeutsche Dichtersprache) based on Swabian, an Alemannic dialect. This historical interpretation is complicated by the tendency of modern editions of MHG texts to use normalised spellings based on this variety (usually called "Classical MHG"), which make the written language appear more consistent than is actually the case in the manuscripts. Scholars are uncertain as to whether the literary language reflected a supra-regional spoken language of the courts. An important development in this period was the Ostsiedlung, the eastward expansion of German settlement beyond the Elbe–Saale line which marked the limit of Old High German. 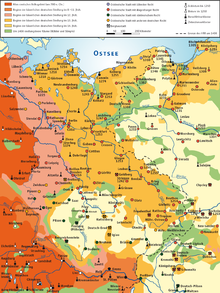 This process started in the 11th century, and all the East Central German dialects are a result of this expansion. "Judeo-German", the precursor of the Yiddish language, sees attestation in the 13th–14th centuries, as a variety of Middle High German written in Hebrew characters. Culturally, the two periods are distinguished by the transition from a predominantly clerical written culture, in which the dominant language was Latin, to one centred on the courts of the great nobles, with German gradually expanding its range of use. The rise of the Hohenstaufen dynasty in Swabia makes the South West the dominant region in both political and cultural terms. Demographically, the MHG period is characterised by a massive rise in population, terminated by the demographic catastrophe of the Black Death (1348). Along with the rise in population comes a territorial expansion eastwards (Ostsiedlung), which saw German-speaking settlers colonise land previously under Slav control. The centres of culture in the ENHG period are no longer the courts but the towns. With the exception of Thuringian, the East Central German dialects are new dialects resulting from the Ostsiedlung. the marking of vowel length is almost entirely absent from MHG manuscripts. the marking of umlauted vowels is often absent or inconsistent in the manuscripts. a curly-tailed z (⟨ȥ⟩ or ⟨ʒ⟩) is used in modern handbooks and grammars to indicate the /s/ or /s/-like sound which arose from Germanic /t/ in the High German consonant shift. This character has no counterpart in the original manuscripts, which typically use ⟨s⟩ or ⟨z⟩ to indicate this sound. the original texts often use ⟨i⟩ and ⟨u⟩ for the semi-vowels /j/ and /w/. A particular problem is that many manuscripts are of much later date than the works they contain; as a result, they bear the signs of later scribes having modified the spellings, with greater or lesser consistency, in accord with conventions of their time. In addition, there is considerable regional variation in the spellings that appear in the original texts, which modern editions largely conceal. Grammars (as opposed to textual editions) often distinguish between ⟨ë⟩ and ⟨e⟩, the former indicating the mid-open /ɛ/ which derived from Germanic /e/, the latter (often with a dot beneath it) indicating the mid-close /e/ which results from primary umlaut of short /a/. No such orthographic distinction is made in MHG manuscripts. The charts show the vowel and consonant systems of classical MHG. The spellings indicated are the standard spellings used in modern editions – there is much more variation in the manuscripts. Not all dialects distinguish the three unrounded mid front vowels. It is probable that the short high and mid vowels are lower than their long equivalents, as in Modern German, but this is impossible to establish from the written sources. The ⟨e⟩ found in unstressed syllables may indicate [ɛ] or schwa [ə]. MHG diphthongs are indicated by the spellings: ⟨ei⟩, ⟨ie⟩, ⟨ou⟩, ⟨öu⟩ and ⟨eu⟩, ⟨üe⟩, ⟨uo⟩, having the approximate values of /ei/, /iə/, /ou/, /øy/, /eu/, /yə/, and /uə/, respectively. Precise information about the articulation of consonants is impossible to establish, and will have varied between dialects. MHG has long consonants, and the following double consonant spellings indicate not vowel length as in Modern German orthography, but rather genuine double consonants: pp, bb, tt, dd, ck (for /kk/), gg, ff, ss, zz, mm, nn, ll, rr. It is reasonable to assume that /x/ had an allophone [χ] after back vowels, as in Modern German. Middle High German pronouns of the first person refer to the speaker; those of the second person refer to an addressed person; and those of the third person refer to person or thing of which one speaks. The pronouns of the third person may be used to replace nominal phrases. These have the same gender, number and case as the original nominal phrase. The possessive pronouns mîn, dîn, sîn, ir, unser, iuwer are used like adjectives and hence take on adjective endings following the normal rules. This includes unser and iuwer, despite the fact that they already end in -er. The inflected forms of the article depend on the number, the case and the gender of the corresponding noun. The definite article has the same plural forms for all three genders. The instrumental case, only existing in the neuter singular, is used only with prepositions: von diu, ze diu, etc. In all the other genders and in the plural it is substituted with the dative: von dëm, von dër, von dën. Middle High German nouns were declined according to four cases (nominative, genitive, dative, accusative), two numbers (singular and plural) and three genders (masculine, feminine and neuter), much like Modern High German, though there are several important differences. Verbs were conjugated according to three moods (indicative, subjunctive (conjunctive) and imperative), three persons, two numbers (singular and plural) and two tenses (present tense and preterite) There was a present participle, a past participle and a verbal noun that somewhat resembles the Latin gerund, but that only existed in the genitive and dative cases. An important distinction is made between strong verbs (that exhibited ablaut) and weak verbs (that didn't). Furthermore, there were also some irregular verbs. The bold vowels demonstrate umlaut; the vowels in brackets were dropped in rapid speech. The vowels in brackets were dropped in rapid speech. dem volget sælde und êre. dô truoc und noch sîn name treit. sô lebet doch iemer sîn name. der noch nâch sînem site vert. He will meet with fortune and honour. knew how to strive for praise. And his name still does so. Commentary: This text shows many typical features of Middle High German poetic language. Most Middle High German words survive into modern German in some form or other: this passage contains only one word (jehen 'say' 14) which has since disappeared from the language. But many words have changed their meaning substantially. Muot (6) means 'state of mind', where modern German Mut means courage. Êre (3) can be translated with 'honour', but is quite a different concept of honour from modern German Ehre; the medieval term focusses on reputation and the respect accorded to status in society. 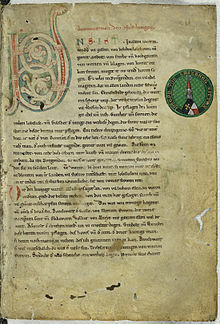 The text is the opening strophe of the Nibelungenlied (c. 1204). vom Kampf tapferer Recken: Davon könnt auch Ihr nun Wunderbares berichten hören. of bold warriors' battles — now you may hear such marvels told! Commentary: All the MHG words are recognizable from Modern German, though mære ("tale") and recke ("warrior") are archaic and lobebære ("praiseworthy") has given way to lobenswert. Words which have changed in meaning include arebeit, which means "strife" or "hardship" in MHG, but now means "work", and hôchgezît ("festivity") which now, as Hochzeit, has the narrower meaning of "wedding". The text is from the opening of Hartmann von Aue's Erec (c. 1180–1190). The manuscript (the Ambraser Heldenbuch) dates from 1516, over three centuries after the composition of the poem. wer der ritter möhte sîn. als ein guot kneht sol. who this knight might be. as a good knight ought to be. if he should find out the knight's identity. ^ Hammarström, Harald; Forkel, Robert; Haspelmath, Martin, eds. (2017). "Middle High German". Glottolog 3.0. Jena, Germany: Max Planck Institute for the Science of Human History. ^ Keller 1978, p. 236. ^ a b Lindgren 1980, p. 580. ^ Waterman 1976, p. 83. ^ a b Rautenberg 1985, p. 1120. ^ Roelcke 1998, pp. 804-811: tabulates the various periodisations. ^ Roelcke 1998, p. 812. ^ a b Waterman 1976, p. 85. ^ Keller 1978, p. 276. ^ Brockhaus 1995, p. 6. ^ Waterman 1976, pp. 87f..
^ Keller 1979, p. 337. ^ Keller 1979, pp. 237: "the population appears to have increased about fivefold." ^ Keller 1979, pp. 336. ^ Keller 1979, pp. 238-239. ^ Rautenberg 1985, p. 1121. ^ Waterman & 1976 103. ^ Eggers1985, p. 1300: "Zu Beginn der frnhd. Periode ist die Stadt längst zum Kultur-, Wirtschafts- und Sozialfaktor geworden." ^ a b Schmidt 2013, p. 278. ^ a b Keller 1978, p. 257. ^ Paul 1989, pp. 5-10. ^ Paul 1989, p. 10. ^ Paul 1989, pp. 26ff. ^ a b Paul 1989, p. 30. ^ a b c Paul 1989, p. 31. ^ a b Paul 1989, p. 32. ^ Paul 1989, p. 29. ^ Paul 1989, p. 19. ^ Edwards 2007, p. 2. ^ a b Lexer 1999. ^ Bartsch & De Boor 1998. ^ Leitzmann 1939. Standardised classical MHG. ^ Edwards 2014, p. 5. Brockhaus, Wiebke (1995). Final Devoicing in the Phonology of German. Tübingen: De Gruyter. ISBN 9783484303362. Lexer, Matthias (1999). Mittelhochdeutsches Taschenwörterbuch (38 ed.). Stuttgart: S. Hirzel Verlag. ISBN 978-3777604930. Retrieved 5 May 2017. Lindgren KB (1980). "Mittelhochdeutsch". In Althaus HP, Henne H, Wiegand HE (eds.). Lexikon der Germanistischen Linguistik. III (2 ed.). Tübingen: Niemeyer. pp. 580–584. ISBN 3-484-10391-4. Rautenberg U (1985). "Soziokulturelle Voraussetzung und Sprachraum des Mittelhochdeutschen". In Besch W, Reichmann O, Sonderegger S (eds.). Sprachgeschichte. 2.2. Berlin, New York: Walter De Gruyter. pp. 1120–29. ISBN 3-11-009590-4. Waterman, John T. (1976). A History of the German Language (Revised ed.). University of Washington Press. ISBN 0-295-73807-3. Bartsch, Karl; De Boor, Helmut, eds. (1988). Das Nibelungenlied (22 ed.). Mannheim: F.A. Brockhaus. ISBN 3-7653-0373-9. Brackert, Helmut, ed. (1970). Das Nibelungenlied. Mittelhochdeutscher Text und Übertragung. Frankfurt-am-Main: Fischer. ISBN 3436013137. Edrich, Brigitte, ed. (2014). "Hartmann von Aue: Erec, Handschrift A" (PDF). Hartmann von Aue Portal. Retrieved 17 February 2018. Edwards, Cyril, ed. (2014). Hartmann von Aue. Erec. Arthurian Archives. German Romance. V. Cambridge: D.S.Brewer. ISBN 978-1-84384-378-8. Edwards, Cyril, ed. (2007). Hartmann von Aue. Iwein or the Knight with the Lion. Arthurian Romances. III. Cambridge: D.S.Brewer. ISBN 978-0-19-923854-5. Edwards, Cyril, ed. (2010). The Nibelungenlied. Oxford World's Classics. Oxford: Oxford University Press. ISBN 978-1-84384-084-8. Leitzmann, Albert, ed. (1985). Erec. Altdeutsche Textbibliothek. 19 (6th ed.). Tübingen: Niemeyer. ISBN 3-484-20139-8. Walshe, M.O'C. (1974). A Middle High German Reader: With Grammar, Notes and Glossary, Oxford, UK: Oxford University Press. ISBN 0198720823. Wright, Joseph & Walshe, M.O'C. (1955). Middle High German Primer, 5th edn., Oxford UK: Oxford University Press. The foregoing link is to a TIFF and PNG format. See also the Germanic Lexicon Project's edition, which is in HTML as well as the preceding formats. For a list of words relating to Middle High German, see the Middle High German language category of words in Wiktionary, the free dictionary.